Sally and I are in Montreal for the Labour Day long weekend. So far, it’s been a nice trip and Sally has really enjoyed it. Sally has been to Montreal before but she wasn’t even one at the time so I doubt she’ll remember. For dinner tonight, we went to The Keg at Place Ville Marie. Some may ask why would you take a four-year-old to The Keg since a steakhouse don’t have a kid-friendly menu. The fact of the matter is, The Keg is a great place to dine with Sally because she pretty much eats for free. 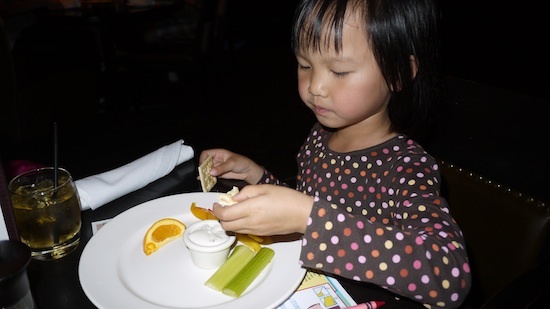 There is nothing on the menu about it, but a child joining an adult for dinner at The Keg gets apple juice, fruits and veggie with dip, and coloring Crayola, all for free. Add in the free loaf of bread with whipped butter, and you won’t have to order a single thing for the little one. 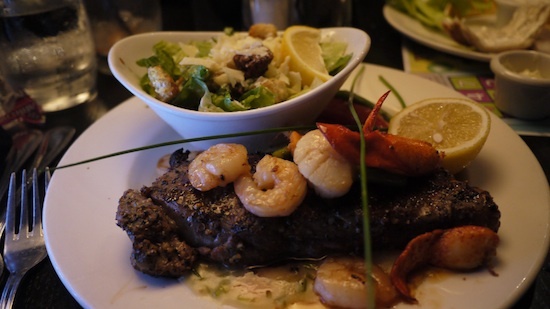 I went with a classic Keg New York Strip, grilled medium rare and topped with a seafood medley of shrimps, scallops and lobster claws. 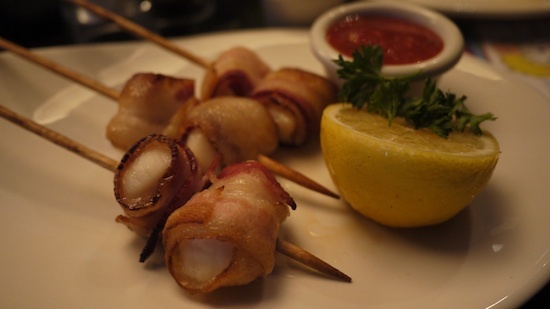 For the opener, I went with their always delicious bacon wrapped scallops. The steak was better than the New York Strip from Rosie O’Grady’s, and it was less expensive too. The Keg is Canada’s most successful steakhouse, with 90 locations and sales of over $350 million a year. You can always count on them to provide a great dinner. The Place Ville Marie stood out as one of the best Kegs I’ve dined at. While the menu is the same, they prepared their dishes with their own little touches. This was the only location that offered a seafood medley with a steak and they presented their bacon wrapped scallops differently than the Kegs in Vancouver. Overall, I was very pleased with my Montreal Keg dinning experience, and I recommend it to anyone who visits the Province. Just remember, the restaurant is very kid friendly, even if they never advertise that fact.